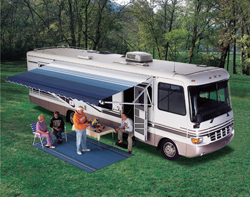 RV awnings should be opened and closed according to manufacturer's specifications. Everything should be secured per the instructions. 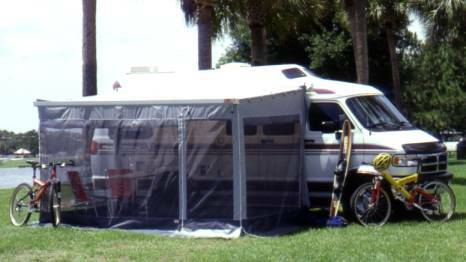 There are often as many as 12 steps to setting up an RV awning. Use the instruction booklet until you are thoroughly familiar with the operation of your awning. Dealers and installers should be happy to walk you through the procedure. Valuable accessories include awning straps and clamps. When properly connected, they could very well save your awning during storms and high winds. Using silicone spray on the inside of the arms will ease sliding. Ribs are overrated. They often stretch vinyl fabric and can void your warranty. Awnings should be tilted when set up to provide rain runoff. Make sure clearance for the entrance door is maintained. An RV door will tear an awning. Brush off the awning with a long-handled brush or dust mop before closing. Try to keep it dry before storing whenever possible. Mildew loves vinyl and it will destroy the fabric. Use a commercial vinyl cleaner for maintenance. Never use household cleaners of any kind on an awning. Tree sap is a major problem for any awning fabric. Awnings should be cleaned at least every two months.